"There is one poem, and that poem is the search." 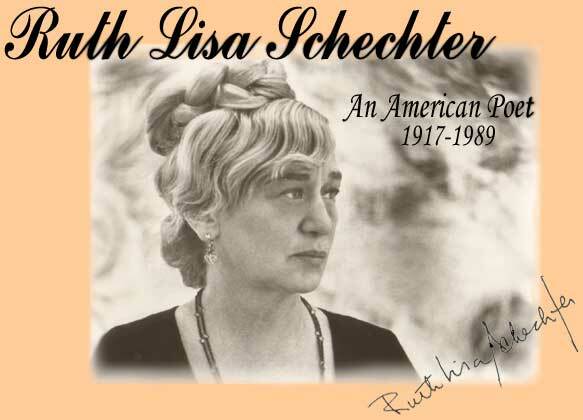 Born in Boston, Massachusetts, Ruth Lisa Schechter grew up in New York City, the only child of a Russian-Jewish immigrant mother. She spent most of her working life in New York‘s hospitals. In the 1960’s, she began writing seriously, giving readings, and studying with Louise Bogan. During the last fifteen years of her life, she lived in Croton-On-Hudson, New York, where she founded the Croton Council of the Arts and edited the Croton Review. She was a poet and a catalyst of all things creative. She died in 1989. During her life as a poet, she wrote eight books of verse (one in collaboration with photographer Paul Kaufman). Her work appeared in half-a-dozen anthologies and over 150 poetry journals. Two of her poems, Alan, Carlos, Theresa, and Moving Closer were adapted as plays and staged in New York. She read her work widely, lectured at colleges, mentored younger poets, and served as a poet-in-residence at Mundelein College, near Chicago. She also won fellowships to the MacDowell Colony in New Hampshire and to the Virginia Center for the Creative Arts. She worked with other artists in the “Committee for Responsibility” during the Vietnam War. She was also a pioneering poetry therapist, working for many years at Odyssey House, a drug rehabilitation facility in New York City. Ruth Lisa Schechter was a member of P.E.N. and of the Poetry Society of America, which honored her with the Cecil Hemley Award. Her first book was recorded in the Lamont Poetry Library, Harvard University. Her literary papers can be found in the Archive of 20th Century Writers, at the Mugar Memorial Library, Boston University.